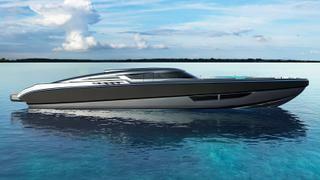 The 24 metre X-80 has been described as "the ultimate luxury chase boat"
Italian designers Federico Fiorentino Yacht Design has revealed its latest project, a 25 metre “Super RIB”. 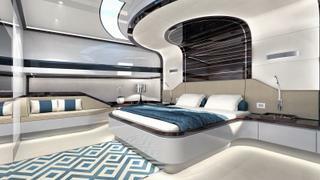 The design firm has partnered with builder Sacs Bespoke Operation Division (SBO) on the project, X-80. It follows a number of recent collaborations between the two companies which saw Federico Fiorentino provide the naval architecture for Sacs' entire Rebel line. The spacious interior features a 25 square metre full-beam master suite amidships, a twin guest cabin forward and a crew cabin. The open deck meanwhile measures 60 square metres and features a sunbed and living areas. The X-80 can also be fitted with engine configurations up to 5000 hp in either twin or triple configurations.